Agate is a variety of chalcedony found in many different colors and degrees of translucency. There are several varieties of agate named after their location of origin or physical characteristics. The layers of agate form as layers of chalcedony line a cavity (or vug) in a host rock. The banding that characterizes agate has made it the perfect medium for the carving of cameos and intaglios. Cameos are most often carved with the white layer in relief, while in intaglios, the figure is engraved into the darker layer to expose the light layer below. Agate derives its name from a river in Sicily, the Greeks called Achates. Vast quantities of agate were discovered in this river as early as 300 B.C. During the reign of Julius Caesar, while engaged in the Gallic Wars, deposits of agate were discovered along the Nahe River in Germany. The Romans set up sophisticated gem-cutting facilities, powered by the running water of the river. These lapidaries have remained in existence for over 2000 years! When the agate deposits were depleted along the Nahe River in the 1800s, the gem cutters in Idar-Oberstein began importing material from Brazil. 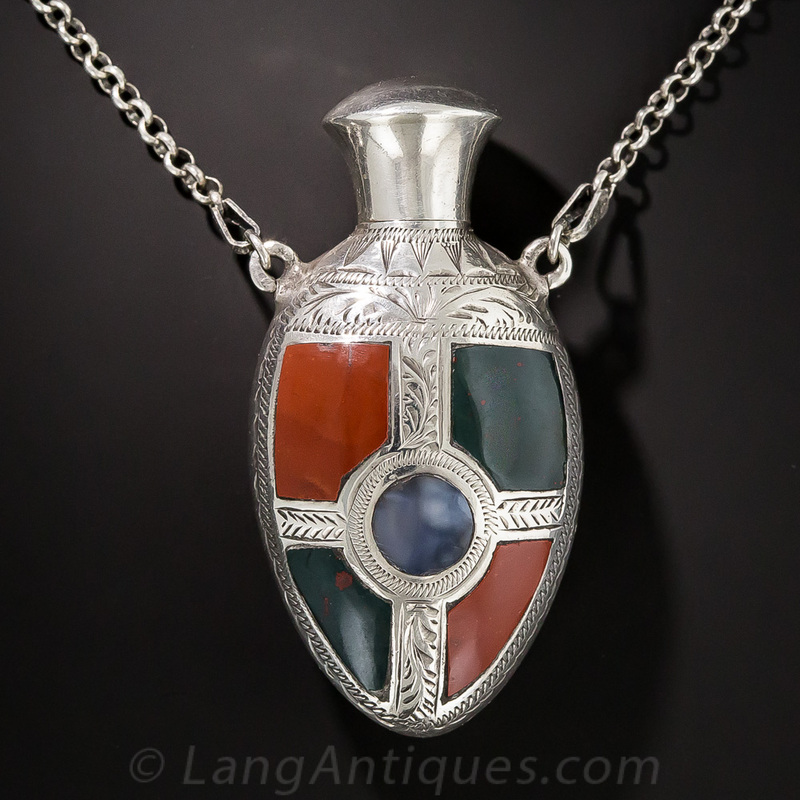 In Egypt, grey agates were often worn around the neck to protect against and heal stiff necks. Ancient Romans believed moss agates to have "divine" power. Ingredients for lotions and ointments were ground on moss agate as it was believed to have the power of improving one's disposition as well as one's eyesight. In Persia and Asia, agates had been used as an anecdote to fevers. They were placed in the mouth to relieve thirst and reduce one's temperature. The Book of Saxon Leechdoms written in 1864 writes that agate prevents harm from thunder, sorcery, demonic possession, poison and drunkenness. During the reign of Queen Victoria, Scottish agate jewelry became the height of fashion. Lovely examples of these Victorian agate jewels are coveted by collectors today. Agates have long been attributed with the ability to aid in love, wealth, good luck, longevity, courage, protection and healing, balance, harmony, generosity, strength, security and the appreciation of nature. Agates are stable and grounding and help one discover their natural talents. Agates foster precision. They are useful talismans for accountants and bankers.